Pablo Neruda wrote this book - or, rather, he wrote the poems in this book. Stephen Mitchell, the translator, chose the poems that went into this volume. (Side note: I love Stephen Mitchell. In addition to Neruda, this guy has translated or adapted Rilke, the Tao Te Ching, the Iliad, parts of the Bible, the epic of Gilgamesh...I envy that kind of facility with language.) 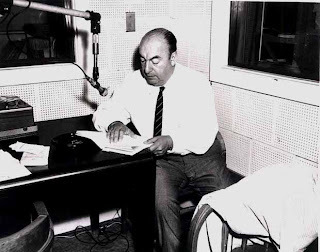 Did you know Neruda's given first name was Neftali? He must not have liked it much if he changed it later, but I've always loved that named because of Isaac Bashevis Singer's wonderful book Naftali The Storyteller and His Horse, Sus. But I digress, as usual. Pablo Neruda was a phenomenal character in the great story of writing across history and you should learn about him. I can't tell you anything I didn't learn from Wikipedia and introductions to his books, because my education did not include poetry in any meaningful way and therefore I learned about this book and others like it because my boyfriend put them in my hands. The poetry of Neruda's I love best, that I do reread with an always-renewed pleasure, is the poetry of his ripeness, beginning with the first book of Elemental Odes, published when he was fifty years old, and ending with Full Powers, published when he was fifty-eight, eleven years before his death. These are the poems of a happy man, deeply fulfilled in his sexuality, at home in the world, in love with life and its infinit paricular forms, overflowing with the joy of language. They are largehearted, generous poems, resonant with a humor that is rare in modern poetry, in any poetry. So that's what the poems are about. And they are. They really are. They're poems about the joy of living. Simple, unpretentious, glorious poems, poems like mangoes, every one. Side note: the Spanish is on the left page, the English on the right. Even though I don't speak Spanish (which is embarrassing, considering where I live) I love having it there, and hopefully you will as well. This is an everywhere-anywhere sort of book. It's a delight to read aloud, and I love picking it up at open mics because it kind of freaks people out and delights them simultaneously to be read something that's not mine, just a work of total beauty; it's a great book to read to a lover, or just to a friend. It will illuminate you wherever you go with its shining language, its way of seeing ordinary things (onions! artichokes! honey!) as luminous emissaries, planets, stars, fragrances. Unlike many poetry books, I find I can read it straight through - there's so much in it but it's also so light that it can be devoured in one sitting like a novel. And many of the poems take a narrative form, which helps. Setting is maybe a silly question for a book of poems, but let's just say it's set firmly and deeply in the heart of Neruda's life, in his prime, as Mitchell says - in the time of his ripeness. lemons came down to the earth. I don't really enjoy reading poetry, although I do love listening to it. I don't know why that is, but it is what it is. Whoa! That's a long drive. Thanks for stopping by - you've been missed, and I'm excited to hear more from you soon! And yes, I think you probably are. In fact, I think most people are.